The Port Fairy Lighthouse was built in 1859, on what was then Rabbit Island, as a navigation aid at a time when Port Fairy was becoming an important trading port for western Victoria. This later became part of Griffith Island. The light is 41 feet above high watermark and its visibility to seaward is 12 miles. The lighthouse was initially manned by two keepers. The last keeper to live on the island was there from 1929 to 1954, when the light was automated; the two stone keepers' cottages were subsequently demolished in about 1956. Griffiths Island is a beautiful destination for a day trip or weekend away, with several scenic walks and picnic spots with a captivating view of the sea. This image belongs to the travel and nature stock photo library. This stock photo of Port Fairy Lighthouse is available for licensing for commercial and editorial uses including websites, blogs, books, magazines, brochures and advertising. Restrictions may apply for images which contain third party copyrighted material or sensitive subjects. Photos of artwork are for editorial use only. 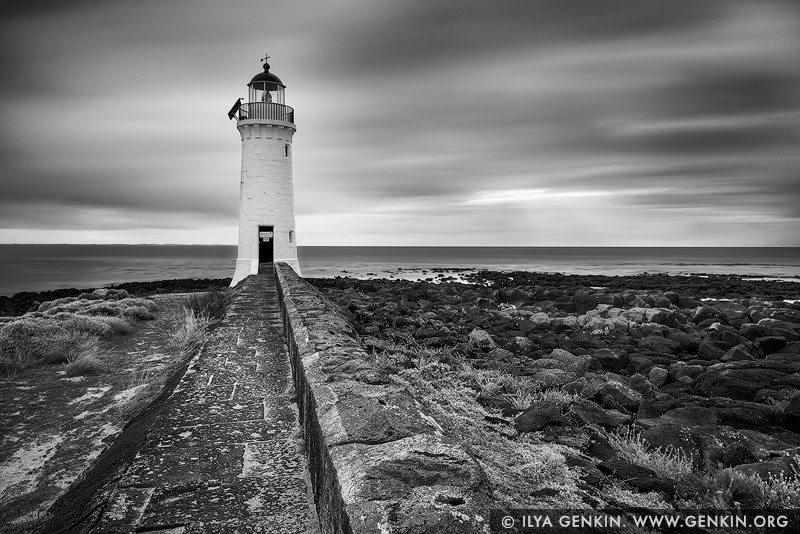 This image id AU-PORT-FAIRY-LIGHTHOUSE-0001 of Port Fairy Lighthouse, is copyrighted © by Ilya Genkin. This is not a public domain image.